Samsung is a criminal enterprise. They do not give two shits about their customers. For proof, look no further than the fact that Samsung has no clue why their phones explode, yet they shipped replacements anyway, assuring their customers they were safe. And now the criminal chaebol refuses to pay their undiscerning pigeons for damages they’ve caused – not even from a sleazy, illegal slush fund. Steve is doing his job. Although I know you’re joking…. Ecclesiastes 9:5… Just saying. No way Steve J’s being forgotten. Why would they be joking? We don’t all believe in your god. Amazing how everyone in every culture is raised to worship the true god excepting the polytheists. If those worshipping the one true gawd variant A are right, what about those worshipping the one true gawd variant Q? I’m awaiting the Flying Spaghetti Monster who comes on Halloween and gives all the good kids iPads. The bad ones get flaming Samsung Phones. Wow, did someone dare cite the Bible? Shocking. Surprising that it took so long for the haters to jump on the change to take a dump on it, with their usual gentle kindness and tolerance. Here’s your chance DavGreg, to tell everyone how stupid God believers are. Please, bring up the Crusades or Inquisition or deaths in the Bible next. Or the Mithras/Horus = Jesus myth. What you do not realize is that many do not hate the Bible or Christianity. Like Ghandi, we just wish those who claim to be followers of Christ acted more like he did back in the day. Second, we want your churches to pay taxes and want you to keep gawd out of politics. Really? So referring to God as “gawd” you consider to be respectful, and you also want non-profit entities to pay taxes only if they are churches? You do know that people every single day, all over the world, act as Christ did, but because you only pay attention to the anti-Christian media you never see it, you only see when people of faith fail. Even that is odd though, because you think Christ either never existed or was a liar, and you consider the Bible to be hogwash. So WHY do you want those who follow a fictional man to more closely adhere to his fictional teachings???? That makes no sense. You know what is *really* funny? You want “gawd” out of politics, right? Donald Trump and Hilary Clinton. A Methodist and a Presbyterian by their claims. Yeah, because keeping God out of government is working out soooo well. I find it funny that anyone actually thinks that God is kept out of government in practice The biases of the people we elect into Congress have always affected our laws for good and bad. We are not keeping gawd out of government. The problems started when we let the Theocrats in. … as the ghost in the machine. SamSplode phones – now in all-new unpredictably distressed burnt caramel! The Boy Scouts of America has now adopted the Samsung Note 7 in their manuals on how to start a fire without matches at a campsite. apple also has a class action lawsuit against them. It’s not just their phones. I was shopping around for a laser printer last night and stumbled across a review of one of Samsung’s printers written by a guy in 2015 who said his printer started smoking 3 months after purchase. Samsung has already remedied that, all their smoking printers now include nicotine patches. The more advanced models have e-cigarette ports. look up at all the mac books, ipods, iphones, and other devices that have killed, electrocuted, catch on fire leaving the customer severely burn or damaging the property. iphones have caught on fire in mid flight and have burn down cars. I got two of them. I hope they recall them if there are airline restrictions, etc. I’ld try to hit my cellular provider and “trade up” to an iPhone now before they are worth zero. No it will not be an iPhone. Not even if it’s free. There is also video a few weeks ago of a plain S7 blowing up in a cafe in England, watching the video is scary, especially when the lady says that her child was playing with the phone in the child seat in the back of their vehicle on the way to the cafe! look up at all the reports of iphone 6 catching on fire since March 2016 to now. iphones have killed people and caused more severe damages and even electrocuted people to death. the ipod touch originally was the first mobile device that caught on fire than the iPhone started catching on fire in 2009 but small reports at that time. Apple has received several dozens reports of its devices catching on fire that the media hasn’t cover cause they only hype the reports of samsung or other companies if they have an issue with the device such as battery being flammable. yeah.. if iPhones have killed people the whole world would have heard big time. As was learned with the exploding Note 7, there are many more exploding Samsung Galaxy S7 Edge phones than what is being reported. Samsung attempts to persuade their customers NOT to report these incidents to the press. It should be the civic duty of EVERY inflicted Samsung customer to report these issues to News organizations because Samsung has sold many more millions of these devices than the Note 7, and they will probably be very reluctant to recall them. If these Samsung S7 Edge devices have the same issues as Samsung Note 7 devices then the general public had a right to know, especially when traveling on airplanes, trains, etc. By reporting these issues Samsung customers could be saving many lives. Needless to say I set her straight. After her asking the usual questions of “what if I just put it in my luggage?” – She’s now flying to Mexico with only the iPhone her husband has. iphone has been catching on fire since 2009. iphones have killed customers and in some cases even electrocuted their customers to death. 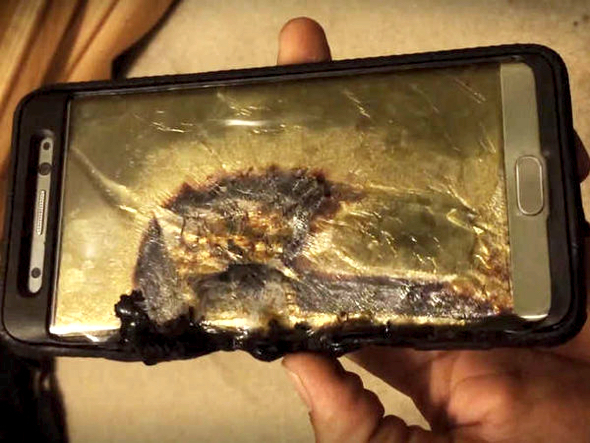 there’s been many reports of the iPhone 6 catching on fire in people’s pocket or exploding. it all started with the ipod touch of reports of it catching on fire. ILLITERATE TROLL JOHN- WTF ARE YOU TALKING ABOUT OUT OF YOUR A$$?? illiterate* did you even research all the reports of iphones catching on fire and causing severe damages from 2009, 2010, 2011,2012, 2013, 2014, 2015, and 2016. iphones have even electrocuted people and killed them. if you throw it in the snow and then cover it up with more snow does that void the warranty?